What a season for Prow! Patty Newell picked up his first Pro Career Point yesterday! And major congrats to Judd on his first Pro Playoff Goal! Kossila assist, Gulls clinched a playoff berth last night. San Diego Gulls 4 Tucson Roadrunners 3 Last game of season, play San Jose Barracuda starting Wed.
Ontario Reign 3 Bakersfield Condors 6 Condors clinched the Pacific division title. Reign last in the Pacific, 7th. 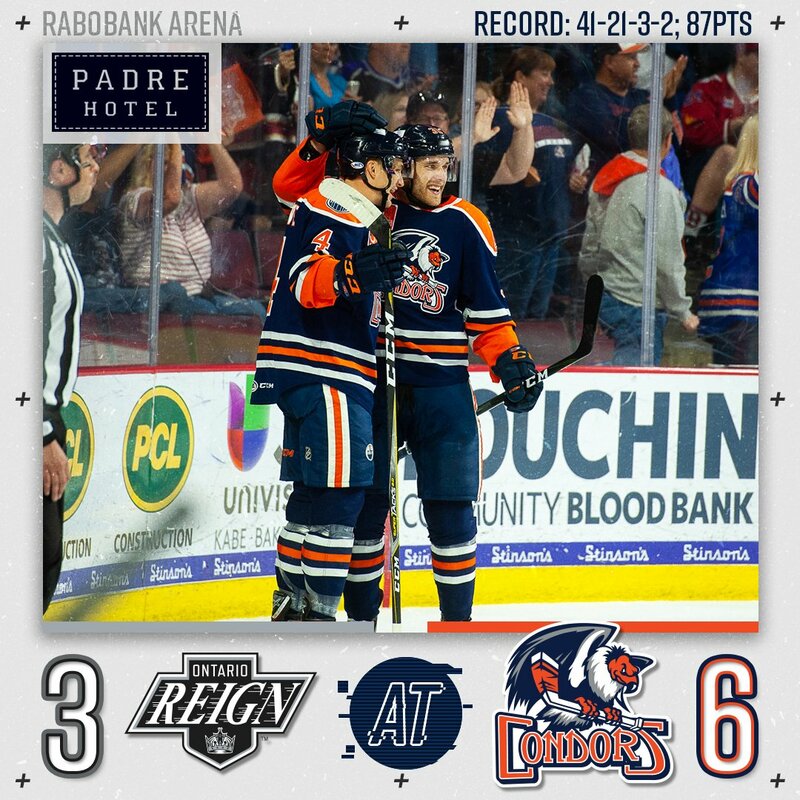 Reign are done, Condors have 1 regular season game left today. Bakersfield will face the Colorado Eagles in the playoffs. Reign forward Mikey Eyssimiont opens up on his battle as a professional athlete living with Crohn's Disease. San Antonio Rampage 3 Texas Stars 0 Last game, missed playoffs, last place, 8th in the Central. Bridgeport Sound Tigers 5 WBS Penguins 2 WBS missed playoffs, 6th place in the Atlantic. 1 game left today. #WBSPENS GOAL GIF - Jake Lucchini ties the game with his fifth goal of the season. Hartford Wolfpack 2 Lehigh Valley Phantoms 3 SO Missed playoffs, last, 8th place in the Atlantic, 1 game left today. Rochester Americans 3 Syracuse Crunch 4 Made the playoffs, 2nd place in the North, play Toronto Marlies- playoffs. 1 game left today. Grand Rapids Griffins 0 Milwaukee Admirals 5 Made the playoffs, 3rd place in the Central, play the Iowa Wild-playoffs. No regular season games left. Last edited by hockeypuck on 14 Apr 2019, 14:59, edited 1 time in total. Awesome game for Blake, including his first Playoff Goal! AHL - Sunday- Last regular season games, San Diego starts playoffs Wed and Thurs, the rest of the teams start Friday-Sunday. Patrick Newell 2 MIN (High Sticking 11:57 2nd) 1 SOG -1 Just thought it was funny since he hardly ever had a penalty in college. 8 MIN in 39 games (at least 2 of those penalties were for just being there and taking abuse), 0 MIN in 33 games the year before, 4 MIN in 6 games in the AHL, had a cross checking penalty in the game before this. Cincinnati, Toledo, Idaho and Kansas City resume play Wed, Florida and Jacksonville on Thurs. Thanks for the update Huskyfan64! Garrett was in the ECHL this year, 15 games I missed...I don't have EP Premium so I can only see 10 of the 15 games played. One game each in Oct. Dec, Feb and Apr and 6 in January. Smith (#1) didn't play in either Jacksonville Icemen game on Apr 11th or 13th but was listed as the backup on the stat sheet. Jacob Benson isn't listed. Former St. Cloud State University men's hockey player Steve Martinson recently became just the third professional hockey coach to win 1,000 game during their career.